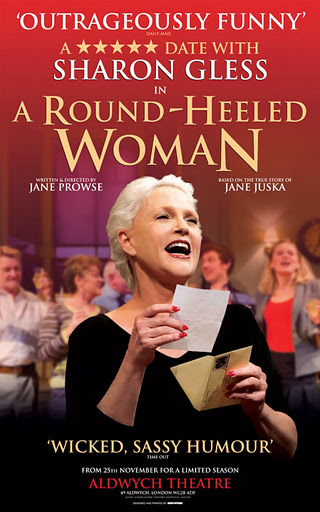 A Round-Heeled Woman made the unexpected jump from the Riverside Studios to the Aldwych Theatre to take advantage of the vacant West End theatre after the early closure of Cool Hand Luke. Adapted from a memoir by English Literature professor Jane Juska which detailed her sexual adventures when aged 66 and after 30 years of celibacy, she posted a personal ad in her favourite journal using the above-quoted line. 63 men responded and the show, written by Jane Prowse, goes through some of the adventures she has in re-engaging with her sexuality. Sharon Gless is mostly excellent as Juska, warm and charismatic, which she needs to be to skate over the rougher edges of her character that the author has tried to smooth out. The troubled family history, the pointed self-centredness, Gless almost makes us forget about these things with an endearing sense of humour but I think that related to my perception of the actress rather than the character. Around her, a small ensemble cover a number of roles: Jane Bertish and Beth Cordingly play a pair of supportive friends nicely – Cordingly also doubles as a Trollope character amusingly well though I really didn’t care for this period addition to the drama. The men have a slighter tougher time of it: Barry McCarthy and Neil McCaul called upon to create a raft of dysfunctional potential bed partners (it’s the same with anyone you know using a dating site isn’t it, it’s always them that’s the problem, never the person themselves). Michael Thomson does well to convince as the one true soulmate she meets (who just happens to be half her age) and also as the son with whom she has a troubled relationship. I did find something a little difficult (and indeed depressing) about the way in which the exploration of sexuality in older people stopped so firmly on the female side. I suppose it is easy to argue that men have been overly well-represented when it comes to this sort of thing (especially in Hollywood) but the balance of this show meant that I took it a lot less seriously than I thought I would have done. Juska rightly points out that depictions of older female sexuality are extremely rare but in limiting the lens through which it is viewed as she does here, I think she is missing a real opportunity. And Prowse’s script does not have the teeth to make it sharply incisive enough about anything else. Maybe it’s just not for my age group, maybe I just wasn’t prepared for the level of schmaltz, in any case I was hugely grateful for the opportunity to see Gless on stage: she may be Cagney in the hearts of many people, but to me, she’s the mum that most gay men would kill for in the US version of Queer as Folk.